Artist's illustration of SpaceIL's lander on the surface of the moon. The first-ever Israeli moon mission will launch before the end of the year, if all goes according to plan. The nonprofit SpaceIL and the government-owned corporation Israel Aerospace Industries (IAI) announced Tuesday (July 10) that they aim to launch a robotic lunar landing mission atop a SpaceX Falcon 9 rocket from Florida this December. The spacecraft will be launched as a secondary payload from Cape Canaveral. It will begin orbiting Earth on an elliptical path. Then, upon receipt of a command from mission control, the craft will enter a higher-altitude elliptical orbit around our planet, which will reach a point near the moon, project team members said. At this point, the lander will ignite its engines to enter a phase of orbiting the moon prior to attempting a lunar touchdown. This process will be executed autonomously by the spacecraft’s navigation control system, project team members said. The lunar landing would make Israel the fourth country — after Russia, the United States and China — to put a craft on the surface of the moon. The nonprofit SpaceIL and Israel Aerospace Industries (IAI) plan to launch a robotic lunar landing mission atop a SpaceX Falcon 9 rocket in December 2018. 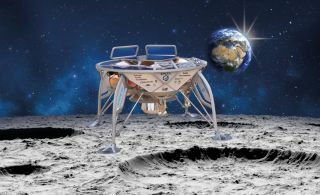 SpaceIL was the only Israeli contestant in the international Google Lunar X Prize (GLXP) competition, which had offered a prize of $20 million to the first privately funded team to put a robot down on the moon, move it at least 1,650 feet and have it beam high-definition photos and video to Earth. The competition officially ended with no winner on March 31, with Google announcing that it would no longer sponsor it. But SpaceIL has continued to work on its moon mission. Approximately $88 million has been invested in the spacecraft’s development and construction, mostly from private donors, project team members said. Several other former GLXP contestants have kept their lunar projects going as well, including the American companies Moon Express and Astrobotic.